Our weekends follow an unspoken routine, and somewhere in the pattern a park falls into place. One of the things I love most about Tokyo, is the neighborhood parks. No matter where you are in the city, it is certain that a child friendly, green patch of land will be a stones throw away. After brunch, we pile the kids in the submarine of a stroller and let the sounds of kids screaming and laughing guide our direction. Often we are led to Midtown Park. 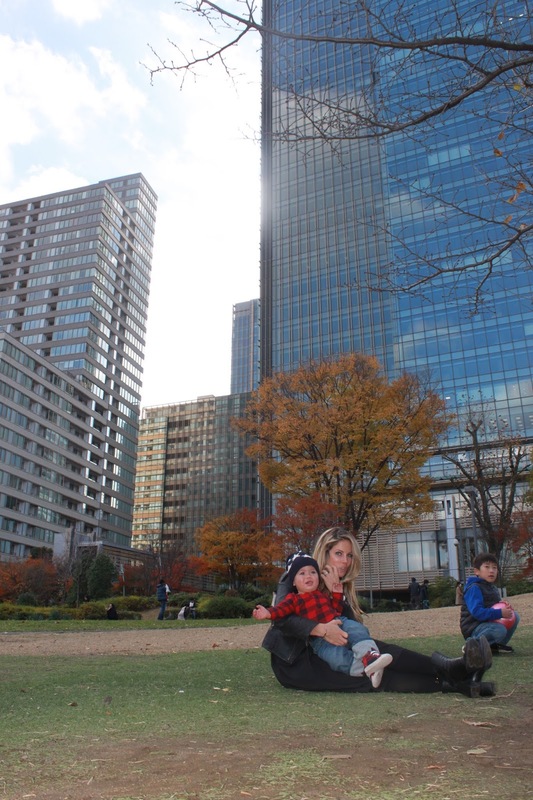 Slides, swings, a Japanese garden and pond all nestle in a green esplanade behind Midtown towers. A little serenity in the chaos of Roppongi and one of the most beautiful little areas in Tokyo. A picnic must for tourists and a favorite hang out for locals. We spent the afternoon chasing Maya up slides and keeping leaves out of Isaiah’s mouth, all while enjoying the cityscape of Toks. It was a good day.